Get the lates on stain removal for every type of fabric care: washable fabrics, upholstery and carpets too! Find out what the care symbols on clothing labels really mean. If its fabric care, its here! 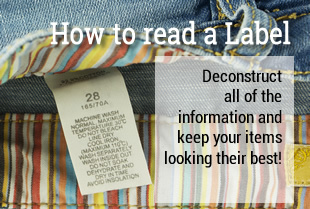 Read the labels and properly care for Career Apparel and Uniforms to maximize the life of the garment.! Learn what the symbols on care labels mean. Learn to make informed decisions about buying and caring for apparel & textile products. Tips for short-term, seasonal, & long-term storage, and for care of wedding gowns & and other treasures. Find acid-free paper, boxes, and kits. Tips for Treating Flood and Fire Damage, Packing for Travel, & More. Read some of the questions and answers concerning common fabric care issues. Invest some time in learning the most important ways to keep your clothes longer and looking their best. The Top 21 & How to Remove Them!